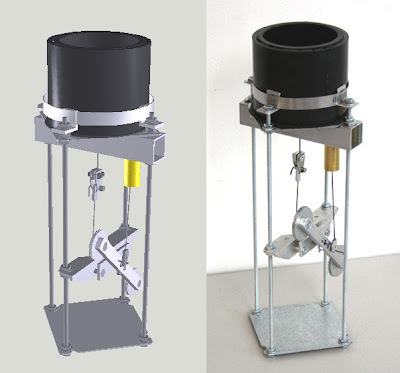 I have added color to the 3D CAD model. You can see it compared above with the physical prototype. There are a few difference between the two—the four support rods on the prototype are about 1.5 inches longer than on the plans. You might also notice I have the crankshaft set 180° from the CAD model. The Adobe viewer for the 3D model gives you lots of flexibility to examine the design as a whole and the individual parts. You can even change the lighting and the rendering. 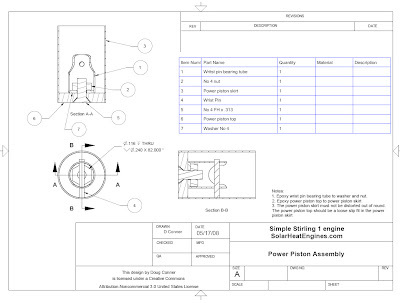 The CAD parts drawings for all the parts are available. There are 16 unique parts that you have make. The only parts I didn’t put up are things like brass tubes and music wire that only have to be cut to a specified length. I’ll cover these in the bill of materials. CAD assembly drawings plus the 3D model should make it pretty clear how everything goes together. 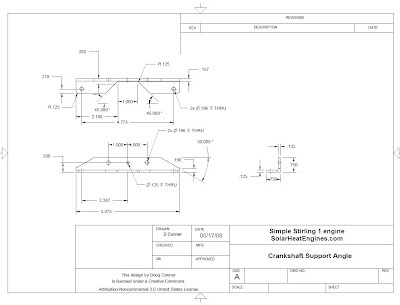 I’ve put up 11 assembly drawings with section views. I have to say the Alibre 3D design software has really saved me a lot of work. I’ll have to put up a post on that later. 2. Building instructions—I’ll put up some general instructions and some specific ones where I think they would be helpful. 3. Running the engine—this part should be fairly simple. 4. Modifications—Making it even better. For those who would like to get more RPM and power I’ll try out a version that uses a metal can for the displacer cylinder instead of the ABS (plastic) one. You’ll be able to run at higher temperatures.